Have you ever wondered why it is so hard losing weight? Most of the times people think that the reason we cannot achieve our weight goals is lack of will, not doing enough exercise or even not having the taste for healthy foods. Is this the real reason behind not achieving our goals? However, the truth is that having a busy life does not allow much time for shopping, let alone cooking whole foods! Time is gold and we really need to juggle things to get our daily tasks done. But the sad truth is that this should not be an excuse: We must have a healthier life, because the alternative not only means putting on weight but also taking a toll on our health. 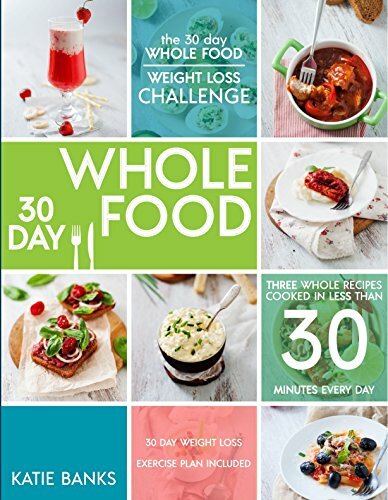 That is why in World Good Foods we offer you the solution: We have compiled 30 whole food days, with 3 recipes each day: 3 whole meals meals a day, spending less than 30 minutes cooking. You will love these 90 whole foods recipes. Yes that´s right, less than 10 minutes per recipe in average! Now you will not have the excuse of not having enough time. Not only that, but you will not even have to think what to cook because you will be provided with a daily meals schedule. A quick and easy exercise schedule to perform at home Also, to provide you with healthier habits, we have given you a 4-week exercise schedule that you can perform at ease at home. It should take less than 30 minutes every day. This all means that in less than 1 hour a day, you can cook the three meals for the next day plus exercising. This way you will feel healthy and fresh! Here is your opportunity to start eating healthy and get rid of all excuses that prevented you from taking on the healthy diet you always wished for.